We'd like to meet with you to explain how our products can solve your unique structural issue. To prepare a free foundation repair quote, we inspect your damaged areas, identify the causes, and create a written proposal that outlines all work to be done. If you live in Connecticut and would like to schedule your free inspection and quote, call or e-mail us today! 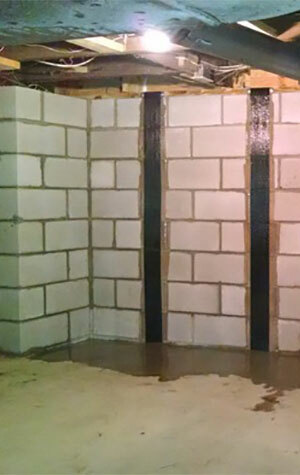 At Connecticut Basement Systems, we have exclusive access to Supportworks' industry leading structural repair products in our Connecticut service area. We're proud to serve Stamford, Norwalk, West Hartford, nearby localities such as Greenwich, Fairfield, Hamden, Milford, Trumbull, Darien, New Canaan, and the surrounding areas. Concrete foundation walls can show signs of cracks and bowing, which is a signal that your foundation is in need of repair. Soil pressure can cause the top of the foundation wall to tilt inward, making additional wall reinforcement a necessity. Our CarbonArmor® and ArmorLock® wall reinforcement systems will secure your foundation walls to the rim joist, preventing soil pressure from pushing the top of the wall inward. These wall reinforcement systems can also be used to reinforce wall crack repairs and ensure structural stability for your foundation.